There is a "stark" increase between the ages of seven and 11 in the proportion of children in the UK who are overweight or obese, new data suggests. The study of nearly 12,000 children found 25% were overweight or obese at age seven, rising to 35% at 11. Between 11 and 14, there was little change, however, which researchers say may be because children of this age are making more of their own food choices. Campaigners are calling for more action on weight issues in younger children. Researchers from the Centre for Longitudinal Studies (CLS) at the UCL Institute of Education analysed information on nearly 12,000 of the children taking part in the Millennium Cohort Study, who were born in 2000 and 2001 and have had their weight and height measured at the ages of three, five, seven, 11 and 14. Rates of excess weight varied by nation, with nearly 40% of young people in Northern Ireland obese or overweight compared with 38% in Wales and 35% in both Scotland and England. The levels showed little change up to the age of seven, but then made a big jump in the next four years. At the age of seven, 25.5% of the boys were overweight or obese - but this proportion rose to 36.7% four years later. With the girls, 23.7% were carrying excess weight at seven - but 33.9% were overweight or obese at 11. However, at 14 the boys' proportion had dropped to 34.1%, while the girls' had risen slightly to 36.3%. The data, which was collected between January 2014 and March 2015, also revealed a link between young people's weight and their mothers' level of education. Nearly 40% of 14-year-olds whose mothers had no qualifications above GCSE level were overweight or obese, while the proportion was 26% among those whose mum had a degree or higher qualifications. Also, children who were breastfed as infants, and those whose parents owned their own home, had lower odds of carrying excess weight at 14. 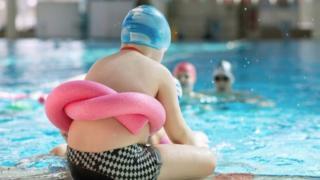 Is UK among worst in Western Europe for child obesity? Dr Benedetta Pongiglione, co-author of the study, told the BBC that while it did not investigate the reasons for the levelling off in rising obesity in 11- to 14-year-olds, trends suggested why this had occurred. "We know that that age of early to mid adolescence is a time where children start to make more decisions on their own, which can imply different... physical activity, diet and other choices," she said. "Peer pressure also plays a bigger role in their lives. "From what we observe, maybe the time between seven and 11 is when parents take most of the decisions." Prof Mary Fewtrell, nutrition lead at the Royal College of Paediatrics and Child Health, and Caroline Cerny, from the Obesity Health Alliance, both called for restrictions or a 21:00 watershed on junk-food advertising. Prof Fewtrell said a range of measures should be considered, including "statutory school-based health education in all schools and robust evaluation of the soft drinks and sugar reduction programme". What is obesity (NHS Choices website)? Ms Cerny said it had to be made "easier for families to make healthier choices". She added: "Children can see up to nine junk-food adverts in just 30 minutes while watching their favourite shows, and we know this influences their food choices and how much they eat." Prof Emla Fitzsimons, another co-author of the study, said: "Children who are overweight or obese face an increased risk of many health problems later in life, including cardiovascular disease and type-2 diabetes. "There is still a worryingly high proportion of young people in this generation who are an unhealthy weight." The government has plans to try to cut childhood obesity, with a tax on sugary drinks coming into force on 1 April 2018. Independent think tank the Centre for Social Justice has suggested it follows the example of Amsterdam, which is the only European city to have lowered obesity rates in the past five years with a variety of programmes - mainly through schools. Childhood obesity rates have also fallen in New York after a poster campaign on the subway system.